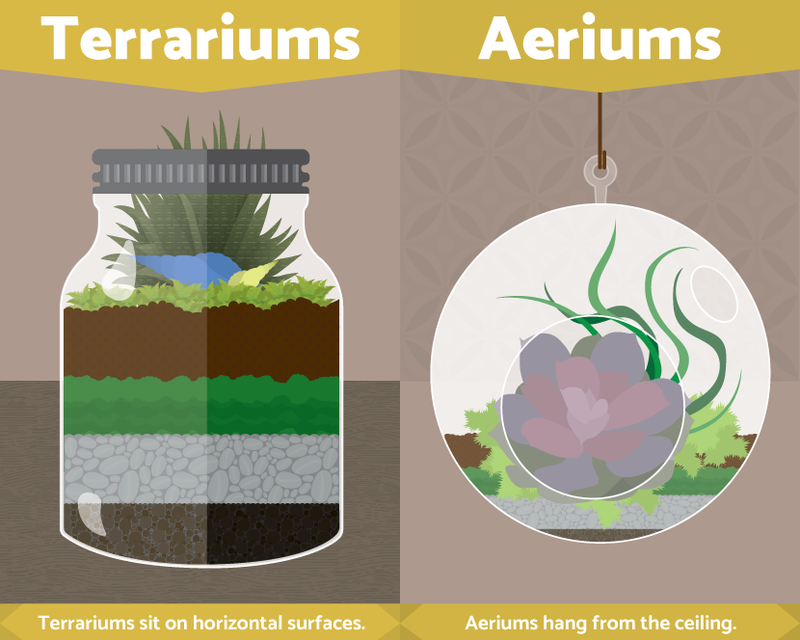 Home » DIY Projects » DIY Terrariums- An Illustrated Guide! Grow a Micro-Ecosystem in a Jar! Many of us remember the terrarium craze back in the 1970s – the standard fishbowl containers with ferns and driftwood that our parents or grandparents used to put together. In recent years, the terrarium has enjoyed a resurgence in popularity, but the new ones are anything but replicas of the ones of past generations. They are fresh, new takes on an old favorite, and the only thing they have in common with their predecessors is that they comprise clear glass containers and plants. It’s almost like Guerrilla Gardening for your home! Here’s what you need to know to create your own mini glass-enclosed ecosystem for your home or office. Clear glass containers are still the way to go – after all, how else would you get to enjoy the contents? But instead of reaching for the standard fishbowl shape, consider your other options. Start by looking around your house for inspiration. Do you have mason jars, clear empty wine bottles, even large light bulbs? Each of these can serve as a terrarium container (for the light bulb terrarium, check out these instructions. Keep a lookout for new and unusual glass containers the next time you’re shopping at a craft store, home improvement store, or discount chain store. They often have containers in more contemporary shapes and sizes – look for large and small squares, cylinders, globes, and rectangles. And have you ever heard of aeriums? These are terrariums that hang, like a potted plant. They can be tiny 6” hanging spheres or much larger glass teardrops – both have side openings and can be purchased online or at your favorite garden center. 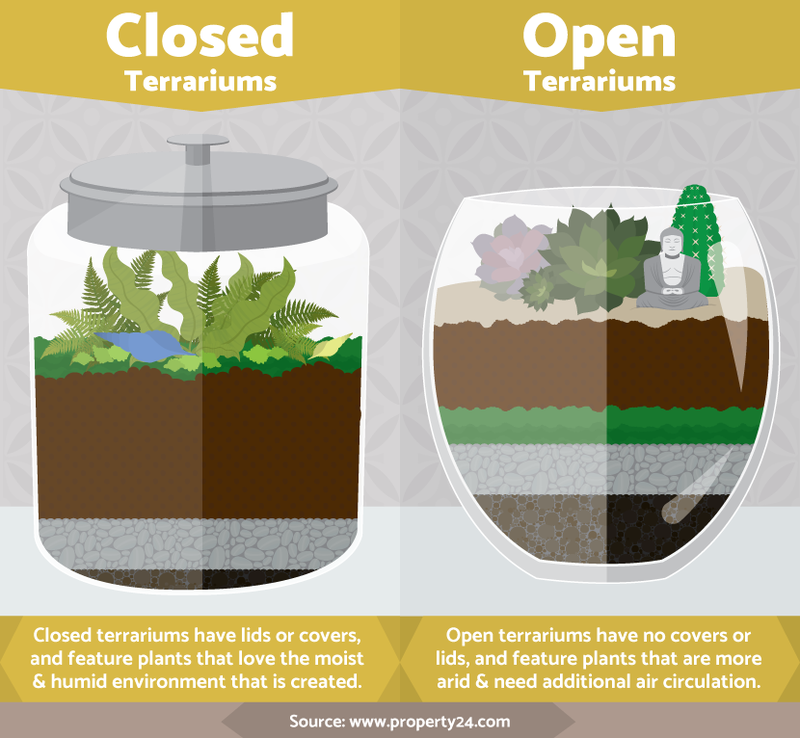 The definition is simple – open terrariums have an opening with no lid, while closed terrariums have a lid that encloses the mini garden – but the differences are huge and can mean life or death for your terrarium garden. Closed terrariums create a humid environment and are perfect choices for those tiny tropicals, like ferns, while open terrariums allow more air circulation for plants like succulents and tillandsias (air plants). Try growing a succulent in a closed terrarium and you’ll quickly have a rotted mess on your hands. When you shop, look for plants in 2” or 4” plastic nursery pots. If your container is a much larger one, suitable as a focal point on a table, you might be able to get away with using plants in 6” containers. Next, make your plant choice based upon which type of terrarium you are creating, open or closed. Plants for closed terrariums include miniature ferns, begonias, mosses, African violets, prayer plants, and baby’s tears. 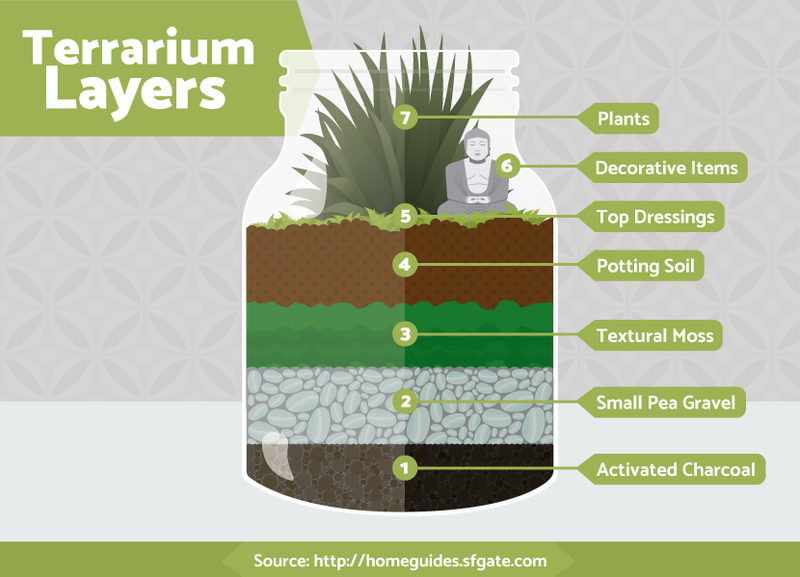 Great plant choices for open terrariums include succulents, tillandsias, dwarf sansevieria, and cacti. Remember that many of the plants that do well in the closed terrarium can also be used in an open one; you may simply need to water them a bit more. Check out the last illustration for tips on plant selection. There are some standard materials you’ll need regardless of the terrarium size or type, and some specific materials/tools that are necessary if you choose particular plants like cacti or vessels like wine bottles. Activated charcoal: This is the base layer of your terrarium, and it helps with drainage and maintenance. Activated charcoal is found at the pet or aquarium supply store, and absorbs chemicals, toxins, and odors in the soil, water, and air that can build up inside your terrarium over time, damaging your plants. Gravel: You can use gravel instead of the activated charcoal, but you’ll need to be a little more on top of your terrarium’s maintenance to avoid rotting and odors if you do. You can simply use gravel as an additional decorative layer, which is part of the fun in creating terrariums. Look for pea gravel, colored aquarium gravel, small river rocks, or smooth moon pebbles. Smaller gravels can also be used as topdressings in your terrarium to cover the soil. Soil: Choose a soil that is recommended for the plants you are using, as ferns and cacti have different requirements. Moss: Different colored mosses, available in the floral section of your craft store, are textural additions to your terrarium. They can be used to separate the soil from the gravel, as a stunning decorative layer, or as a topdressing for the more moisture-loving plants like ferns. Avoid using moss around arid plants like cacti and succulents. Tools: While there are standard tools for terrarium building that can be purchased in a kit, you can also use items found around your home. Chopsticks are great for adding and moving materials through the narrow neck of a wine bottle, tweezers are good for handling spiny cacti, and long-handled teaspoons mimic a miniature shovel or trowel when manipulating materials. Decorative items: These are the items that make your terrarium come to life. Look for tiny statuary (Buddhas, zombies, fairy garden accessories), gnarled driftwood, seashells – anything that makes you smile, expresses your personality, or starts a conversation. 1. Start with a 1-2” layer of your base, either activated charcoal or gravel. 2. Add another layer of either gravel or moss. If your base layer is gravel, opt for a larger river rock for contrast, or moss. 3. Add a layer of soil recommended for your plants. The amount of soil depends upon how large your container is as well as the size of your plants, but should begin at 2-3 inches. If you are using tillandsias, no soil is needed. 4. Carefully add your plants, one at a time, using terrarium tools or items found around your home. Make sure the roots are planted firmly into the soil. 5. Topdress with gravel, river rock, or moss. Most terrarium plants require bright indirect light, so be sure to place your terrarium by a bright window. Keep an eye on your plants’ health, though — if leaves are turning brown, you may need to move your terrarium to a less bright location in your office or home. Watering with closed terrariums is simple and easy – because the lid creates humidity, these types of terrariums don’t need weekly watering. In fact, some can go a few months without added moisture; be prepared to experiment to find the best balance. Start by watering every two weeks, using an eyedropper, spoon, or water sprayer to add small amounts of water to your plants. If plants begin wilting, it’s time to increase the watering schedule, but if water begins to accumulate on the bottom of the container, decrease watering immediately. For open containers with succulents or cacti, water very sparingly, just as you would with these types of plants in any container, and keep an eye on any accumulated water. Remember, terrariums have no drainage holes, so when they feature arid plants, try only adding a dropperful of water at a time. Tillandsias will need to be taken out of the open terrarium, soaked in water for 20 minutes each week, then allowed to thoroughly dry out before they’re returned to the terrarium. Check out fix.com for more!